I just wanted to let you know that if you are looking at this page to see if there are any new photos uploaded, you will not see any. I have stopped uploading photos here completely and rely only on Flickr now. For now, the plan is to upload most photos there, and then keep some of the best here locally. As for now, I do not have a Pro Flickr account, so there are not so many. I plan to upgrade shortly and start uploading my backlog of photos. 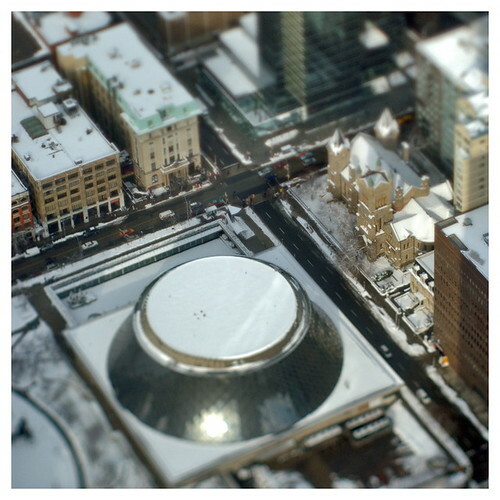 The latest “cool thing” on the Internet seems to be collections of Tilt-Shift photos – especially the trick used when taking photos from a very high point (tall building or helicopter) and focusing on a small area down on the ground, creating an illusion that makes the scenery in the picture look like a model city. It’s pretty cool stuff, and I think the latest Internet craze of this technique, which is not a new one, started with Andy Baio linking to this: The City as an Avatar of itself. Then a flood of information followed; there’s a Flickr group here.